Thawed from a block of ice after thousands of years of entombment, the Brute emerges into a modern world and its strange sights and sounds. 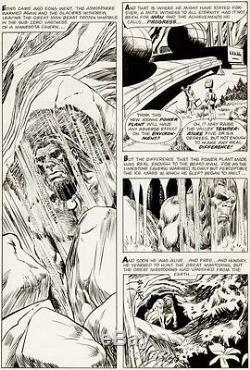 (Seaboard/Atlas, 1975) Penciled by Mike Sekowsky and inked by Pablo Marcos. I have many more Original Comic Art pages and will be listing them in the months to come a few at a time. The item "Original Comic Art Page Pablo Marcos The Brute Issue 1 Page 9 Atlas Seaboard" is in sale since Thursday, December 15, 2016. This item is in the category "Collectibles\Comics\Original Comic Art\Interior Pages". The seller is "atomiki" and is located in Farrell, Pennsylvania. This item can be shipped to United States.